Everybody knows how important user experience is these days. A huge part of user experience is the interface that sits between a user and a service. In an attempt to make the human-computer interaction more efficient, designers continuously try different approaches. In this two part series, I want to discuss the opportunities conversational interfaces bring, the questions they raise, and why we often think of them as the future of user interface. First, I’ll look at what conversational interfaces can do, and how they benefit both you and the user. Then, in part two of this series, I’ll dive into how to best implement conversational interfaces into your designs. You might also like: UX Designers: Are You Focusing Too Heavily on Creating a Beautiful UI? Conversational interface is an interface design that allows users to chat with either real humans or bots. Like anything people design, user interfaces evolved over time. The global goal is to reduce friction and make the interface more accessible to many groups of users. The less friction an interface has, the more usable it becomes. Source: Joshua Porter. The modern history of interfaces begins with the command line interface. It was the first interface people created to interact with machines. Interactions were straightforward — a user types in commands and gets a response. This kind of interface had a significant downside — to interact with the system, users had to learn syntax and remember the proper commands every time. For a long time, command line was the only way people interacted with computers. The situation changed when Apple and Microsoft introduced a graphical interface to the mass market, more than 30 years ago. GUI was an answer to the problem of complexity. The core idea of GUI is based on the fact that recognition is better than recall. The interface was built around the idea of real-world metaphors. Real-world metaphors are elements that represent real-world objects and allow users to form associations with actions. The idea of using real-word metaphors made it easier to interact with systems. Icons and other objects in GUI often represent real-world objects so users can use previous experience and correctly predict what happens when they click on some icons. Since GUI was introduced, it has been hugely popular. Even today, when we think of the interfaces, we often mean computer screens and graphics that we use to interact with systems. We take it for granted — if we need to interact with a computer, it definitely needs a screen. But is a graphical interface really the best solution? All GUI interfaces have one major problem — they are artificial creations invented to enable interactions between human and computer. People have always had to adapt to interfaces — to learn the rules on how to operate with them. The real problem with the interface is that it is an interface. The problem becomes more apparent if we think about why we use digital products in the first place. As users, we use products to solve specific problems. And when we solve problems, we want to focus on the problem itself, not the interface. But interfaces make the process of problem-solving harder because they introduce a cognitive load on top of the problems. The closer we get to a natural human interface, the more comfortable we will be solving problems. And the human natural interface is spoken language. It’s one of the first interfaces we ever came up with. And it has always been our favorite kind of interface. Language is the most powerful, useful, and effective communication technology ever, period. This is why designers are so fascinated with conversational interfaces. Conversational interfaces introduce an opportunity to interact with a machine using natural language. In some form, conversational interfaces are a return to command line. But unlike command line, which requires a user to know the exact command, modern conversational interfaces establish a direct dialog. They can parse complex requests and execute them in real time. As a result, interacting with the system becomes much more user-friendly. Conversation interfaces aren’t anything new One of the first conversational interfaces, called Shoebox, was created in the early 1960s by IBM. It was a forerunner of today’s voice recognition systems. But why didn’t people use the technology back then? The answer is simple — a lack of computational power and inefficient language processing technologies wouldn’t allow it. Computational power:If we compare modern devices with the computers we had two decades ago, we’ll see that gap between computational power. Modern devices such as the iPhone 6 are one hundred times more powerful than the Apollo 11 computer. Not to mention that our devices are connected to the internet almost all the time, meaning that we can use the power of cloud computing to process significant amounts of information. Language processing algorithms: Last year we saw a lot of advantages in natural language processing — both in technologies of speech recognition (understanding language) and artificial intelligence (learning from experience). Accuracy improvements in the past two years have dwarfed all improvements over the past thirty years combined. People are used to texting: 8.3 trillion — that’s the number of text messages sent every year. Almost 16 million messages are sent every minute. People use messaging apps more than any other apps: 90 per cent of our time on mobile is spent on email and messaging platforms. In 2015, for the first time in history, users spent more time on messaging apps than on social networks. 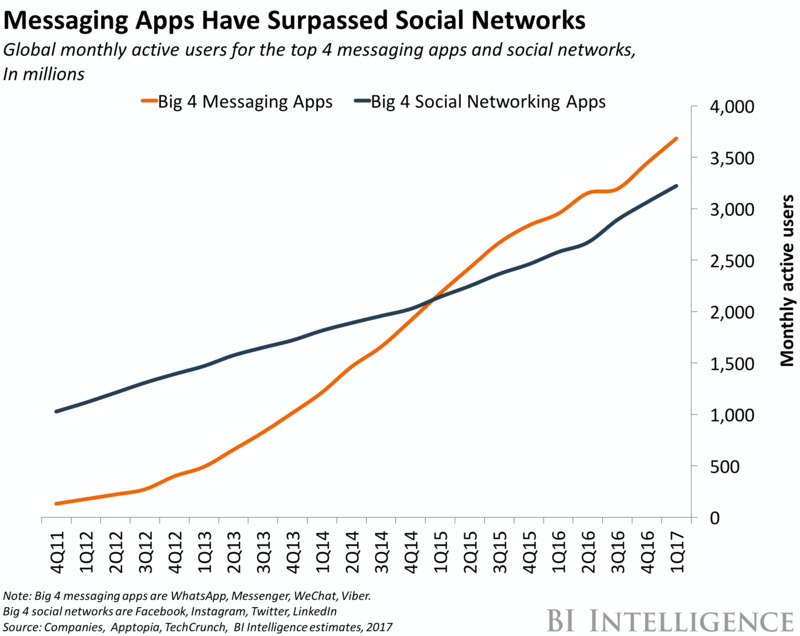 Messaging apps have surpassed social networks. What does this tell us? It tells us that users clearly prefer these kinds of interactions. Image credit: Business Insider. The fact that people are spending more time in messaging apps than in social networks makes it clear that messaging apps are the platforms of the future. Since chat is the new email or phone, chatbots will be the tools users use to access all sort of services. And if you’re going to build a business online, it’s logical to build it where the people are — inside messenger apps. Feels more natural than apps: Users interact using text commands in natural language. Don’t need to learn new skills to interact with an interface: To interact with a majority of chatbots, you don’t need to learn something new. Allows personalization: Chatbots can be adapted to different types of users. For example, it’s possible to deliver content based on your users' individual preferences, meaning that two different individuals who use the same interface can be presented information in a completely different way. No need to download a separate mobile app: Many users don’t want to install a separate app from a brand on their phone. When users interact with service using chatbot they don’t need to download an app. No judgment: Users are more comfortable sharing personal information with a chatbot than with real humans because a chatbot won’t judge them. This is particularly true when it comes to finances or health. With chatbots, it’s possible to optimize the way people consume content. Chatbots allow us to deliver content based on a person’s interests in the form of a dialogue. There are already a few apps available on the market that allow this. One of them is the CNN bot for Facebook. The app delivers content in the form of a direct conversation — users can choose content they are interested in reading and can ask the bot for more information. To see how it works, send a message to the CNN chatbot on Facebook. CNN has a conversational bot for Facebook. Quartz for iOS is another excellent example of an app that uses chatbots to deliver content. The format of this app is a bit different from CNN — users receive the news via a pre-programmed course of messages, and after every new message they get two options to choose from. Users can ask for more details on the story, or trigger the next topic to be sent. Unlike the CNN app, which uses a very formal way of delivering content, all messages in Quartz are written in a very relaxed way. It’s almost like you’re hearing the news from your friend, not an app. Quartz is a conversational news app. The term ‘conversational commerce’ was popularized by Chris Messina. In a nutshell, conversational commerce is all about shifting the focus away from storefront-like experience (e.g. building a great physical storefront or webstore), and towards a simple chat interface. This interface can live inside a popular service like Facebook Messenger, WhatsApp, or WeChat, but it can also exist as a standalone app on your mobile phone. The big difference of this type of experience is that it’s a one-to-one communication channel with the customer. Users interact with the store just like they interact with a real person, like a customer assistant. But the ‘person’ on the other side of the message doesn’t have to be a human; it can be a bot. 1. Selecting a product from the list of options (browsing different products and comparing them to each other). 2. Adding the product you like to cart. 3. Proceeding with the checkout process (in most cases, you’ll need to register on the website). 4. Paying for the product. 5. Checking your email for information about your purchase. But what if you can simply start a conversation with chatbot? The chatbot could act as a consultant. It asks you a few questions and suggests a model you might like. The bot is mirroring the type of experience you would get when you go into the real retail store. And if this bot is triggered in Facebook, you won’t need to go through the long process of creating a new account and providing payment information, since the app already has all the required information from your profile. Another beneficial use of this interface is to trigger different services without ever leaving the messaging app. For instance, if you’re chatting with a friend about going on vacation, there’s no need to move away from the messenger to find information about places using a search engine. Instead, you can trigger the service right in the messenger by mentioning it in a conversation. Less friction, same result. Isil Uzum’s concept of shared interfaces, which you can see below, clearly demonstrates the benefits of such approach. You can see that users can complete a pretty complicated interaction —selecting a flight and paying for it together — without ever having to leave their messaging app. Calling bots to a group conversation for tasks done together. Serving to multiple users on one common interface. Image credit: Isil Uzum. Chatbots are great for onboarding new users. One good example can be found in Slack, a corporate messaging app. This app has something called the Slack Bot, which welcomes first-time users and provides all required information in an easy-to-understand way. Slack Bot welcomes new users and provides all required information right from the start. Image credit: Des Traynor (Intercom). Chatbots can provide a competitive advantage. If we analyze the success of Slack, chatbots are one reason why this platform is growing so quickly. Slackbots like Howdy help people automate everyday tasks like scheduling meetings and notifying people about upcoming appointments. Howdy helps you schedule a meeting. Other tools like Birdly allows teams to integrate data from CRM databases like Salesforce so team members can see customer history without ever leaving Slack. Birdly allows teams to integrate data from CRM databases. A new generation of chatbot is driven by deep learning — a sophisticated version of machine learning, known as artificial neural networks, which is used to recognize patterns in speech. One great example of a chatbot that was built using deep learning technology is called Xiaoice. Xiaoice is an advanced natural language chatbot developed by Microsoft for the Chinese market. This chatbot is currently used by 40 million people. The app can adapt its phrasing and responses based on positive or negative cues from its human counterparts. It also remembers details from previous conversations with users and uses this information for later conversations (e.g. to ask follow-up questions). When users interact with Xiaoice, it communicates back with independent opinions and suggestions that are not pre-programmed. The ability to learn makes it more engaging and exciting. Image Source: Digitaltrends. There’s one thing that makes this chatbot stand out from the crowd — people don’t think of it as a machine, but rather as a friend or therapist. They are willing to confide in the bot just as they do with human friends. People often turn to Xiaoice when they have a broken heart, have lost a job, or have been feeling down. Xiaoice recognizes emotions from the text. The chatbot can respond with empathy and sensitivity. Image Source: EJ Hassenfratz. Voice interfaces allow us to interact with computers through a voice. Similar to chatbots, voice user interfaces (VUIs) are hitting the mainstream and becoming ubiquitous in our daily lives. Today we can find them in smartphones, smart homes, TVs, and a range of other products. According to Google, 20 per cent of all search queries on mobile and Android are voice-based. According to Gartner, by 2020, 30 per cent of web browsing sessions will be done without a screen. Fast communication: Humans deliver and process audio far more than quickly they do all other media. People can speak a lot faster than they can type. An average person speaks around 16,000 words a day. Easier way of communication: Voice is not just faster; it’s also easier than typing a message. There’s a reason why in China, people send voice messages to each other rather than text. More natural way of interaction: Voice communication is a natural way for humans to communicate. This means that voice interaction systems are more comfortable than visual interfaces for the vast majority of users. More convenient way of interaction: Interacting with a VUI simply requires a user to speak to the device. A VUI doesn’t force users to learn and recall specific commands or methods of interaction, therefore creating less friction. Voice communicates personality: As human beings, we subconsciously equate the sound of human speech with personality. Pace, tone, and other voice attributes can be used by brands to create a right impression on the user. Accessible technology: Most people can use voice. It’s accessible for people of different ages. Voice interfaces can help users save time on routine tasks. Checking the weather, setting an alarm, replying to an incoming message, searching for the recipe — these are examples of tasks we do every day. Of course, each of them can be done using GUI, but it requires users to turn their attention to a device to do so. In some contexts, voice interfaces are more preferable—such as when driving. This research by Creative Strategies shows the most favorite interactions for users. Voice assistants are quickly becoming an essential part of our digital experience. New technologies will make it easier to provide tailored digital experiences to people. A personal assistant can not only understand our current needs but also predict our future needs. It will be able to aid in every aspect of your life, even the areas you don’t think about. Using voice interface can be helpful for multi-step operations. For example, suppose you want to return a purchased item to the store. Rather than doing it using a few different channels (e.g., finding the email with details of the order, filling out the return form, and dealing with customer support over the phone), it’s possible to achieve similar results with less friction via a simple conversation. The system will do all the work - collect all required information and create the appropriate requests. Right now, web and mobile is mess; each time users have to buy something or use a service, they have to download an app and create an account. That’s where voice-based systems can really evolve. VUIs stop users from needing to install different apps or create separate accounts for each service they use. Instead, it brings them all together through conversation. Why download an app for booking a flight or ordering a taxi when you could just ask one chat interface to do it? The Verge shows how easy it is to order an Uber with Amazon Echo — soon, this functionality will be available for many different services. It’s not only your phone and your computer that are connected to the internet. Smart thermostats, lights, kettles, and many other Internet of Things (IoT) devices also have an internet connection. Not all of these devices naturally suit a graphical user interface. Using a VUI will help integrate such devices easily into our environments. You might also like: The Pivotal Role of User Experience Design in Brand Building. Conversational interfaces are changing the way users interact with their devices every day. Understanding the benefits of these interfaces can help you decide if these interfaces are right for your design. In part two of this series, we’ll look at what steps to consider when designing a conversational interface. Will you be using conversational interfaces in your digital designs? Let us know in the comments below!